Fishing has been a part of my life for as long as I can remember. When I was a little girl, my father would load up my brothers and me in a rented RV and take us up the 395 Highway for a week of lake fishing in the high Sierra. We began the trip in the evening so that we would cross the desert during the coolest part of the night. Along the way, my dad would always stop at a gas station for fuel and to buy the kids a hot chocolate to help us sleep on the road. Later in life my husband introduced me to fly fishing. Now, I have a hard time calling myself a fly-fisherwoman, because I have never tied my own fly—not even once. My husband has always done it for me, or a guide on the few occasions when we have hired one. But I don’t feel badly about that at all—well, maybe a little! Still, I have so much fun fly fishing that I’m just glad to be out there with my line in the water in the middle of God’s gorgeous creation, waiting to see if I can outsmart a big (I’ll take a little one, too) trout that day. The summer before our son Ben died from a skiing accident twelve years ago, we took a family trip to Oregon and fished the Deschutes River. Ben had a natural touch when it came to fly-fishing, and he loved being out in nature casting his flies on the water. 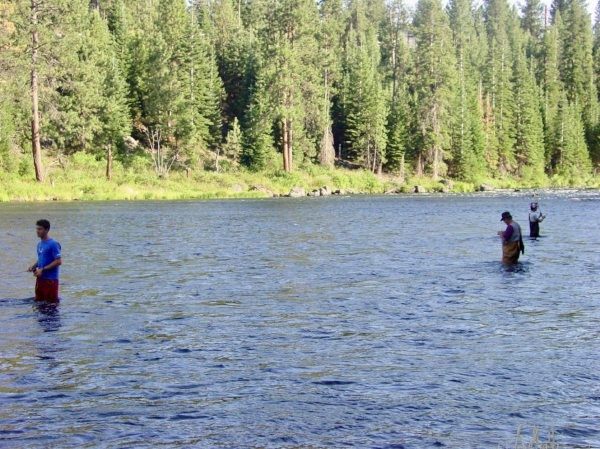 The photos I have of him fishing on the Deschutes are especially precious to me. My sons (Andrew on the left and Ben on the far right) fishing with their dad on the Deschutes River in Oregon. 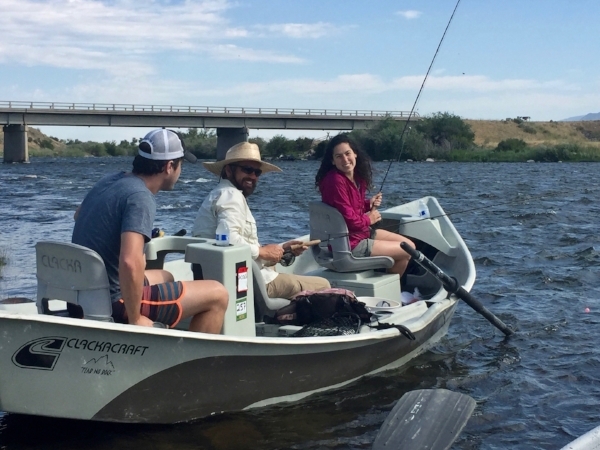 Last year my husband and I decided to splurge and treat our children and their spouses to a long weekend stay in July at a boutique lodge called Grey Cliffs Ranch in Montana for fly fishing on the Madison River. Our friends Dan and Judy joined us, and we almost filled up the lodge with our group of nine people. Since my husband is the one who ties everyone’s flies and takes care of all the equipment when our family goes fishing, it was a treat for him to have a guide and get to relax a bit. The Grey Cliffs managers, Chris and Tracy, met us at the airport and drove us out to the ranch. Since we didn’t have a lot of time before dinner, they took us trap shooting at a range on the property for a couple of hours. Chris and Tracy spent a good part of the time teaching us about gun safety, even though all of us handled shotguns before. We all hit some clay targets and then went off to a wonderful home-cooked gourmet dinner by the lodge’s chef, Mike. Even though the accommodations at Grey Cliffs were upscale, the team somehow managed to give everything a relaxed, casual feel. The next day we set off for a full day of fishing on drift boats, with one guide (Chris and Tracy included) for every two people fishing. The men drove us farther up the Madison River, above the Ennis Reservoir, where the water was colder, as they felt it would be too hard on the fish for catch-and-release closer to the ranch. My husband and I had a fantastic time catching more fish than I can remember exactly—I think around twenty between the two of us—as we floated down the river with our highly knowledgeable guide, Miles Nolte, who is a wildlife author as well as a fisherman and hunter. We did nymph fly fishing (the fly goes under the water), which was fairly new to me, as I had mostly done dry fly fishing with my husband. I had to learn to look for the bobbing balloon on the water instead of a dry fly, and that was a bit of a challenge for me. The most exciting part of the day was when I caught a 17-inch Rainbow trout. It was a battle as the fish tried to swim away with the line and then switch tactics by moving toward the boat in an attempt to make the line slack so it could get the barbless hook loosened from its mouth. In the end, I got a photo with my beautiful fish before Miles released it back into the river. The most amazing part of the story was the knot Miles found in the line when he was retying my fly afterward. He showed me the knot before barely putting tension on it. The line broke with hardly any effort! How I was able to reel in that fish without the line breaking from that knot is still a mystery to me today, but perhaps the good Lord knew I was going to get skunked the next day, and he wanted me to have that special moment with the biggest Rainbow trout I have ever caught. 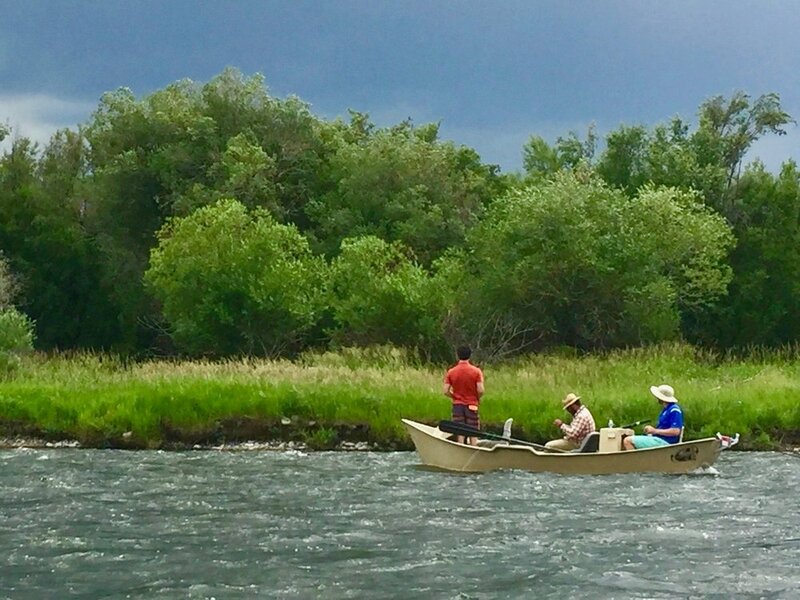 Over the course of one and a half days of fishing, we all caught a good amount of fish, ate lunch along the river, and were thankful for the clouds God sent to give us shade from the hot weather. It was fun to see my husband get the opportunity to take in all the scenery and enjoy spending time with everyone without all his usual responsibilities when we go fly fishing. Still, all the fish we caught couldn’t begin to compete with the overwhelming grandeur of the scenery before us from the river itself, the surrounding banks filled with wild grass and flowers, and the majestic mountain range in the distance. It’s easy to understand how many feel it’s impossible to go back to city living after spending time outdoors in places that have been relatively untouched by human hands. After our half day of fishing, Chris and Tracy drove us up the Madison with tubes so we could drift down the river where they would be waiting to pick us up. I can’t begin to describe how much fun we had tubing on the Madison. There were ropes we could use to attach the tubes to each other, and there were quite a lot of antics going on along the way! I would definitely recommend boat shoes, as the rocks were pretty slippery if you got off your tube at some point. In the evenings, we had more lovely dinners, spent time on the deck taking in Montana’s legendary big sky, and played charades and a fun game one of the kids brought. We laughed so much and never once watched TV. It was wonderful having our friends along with us—a special time we will always cherish. It was difficult to say goodbye to Chris and Tracy by the time we left that Monday, and we were already trying to figure out how we could find a way to return to Grey Cliffs and the Madison River in the future. The trip was one more chapter in my life of marveling at and connecting with God’s creation via fishing. It brought back to my memory a previous fishing excursion to the east side of Yosemite Park where my husband and I hiked into a remote spot not far away from where my dad took me fishing in my childhood. Like the Madison River, the tucked-away place was suspended somewhere between heaven and earth—serene, stunningly beautiful, and far removed from the cares of this life. You have likely experienced a similar feeling if you have been out in a pristine part of nature: not quite in one place or the other—almost like another world entirely. It is a taste of what earth must have been like before the fall and what the new heavens and earth will be some day. It leaves you breathless—and filled with expectation—for what is awaiting all whose hope is found in Christ our Lord. This article was originally published by Journal of a Christian Sportsman. Should Christians Use the Term “Eucharist” for the Lord’s Supper?